^ a b Great Britain: Parliament: House of Commons: Transport Committee, ed (2005). 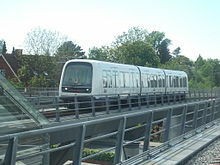 Integrated Transport: The Future of Light Rail and Modern Trams in the United Kingdom. The Stationery Office. p. 216. http://books.google.com/books?id=cVfnWO9pC8oC&dq=30%2C000+PPHPD&q=216#v=onepage&q&f=false 2014年2月22日閲覧。. ^ Busan-Ginhae Light Rail Transit Archived 2012年3月28日, at the Wayback Machine. ^ Puente, Fernando (30 July 2014). “Malaga light metro network opens”. International Railway Journal. http://www.railjournal.com/index.php/metros/malaga-light-metro-network-opens.html?channel=525 2014年11月28日閲覧。.